"I believe success is achieved by acquiring and developing talented, respected and credible individuals," Aikman said, "none of which applies to Skip Bayless." Troy Aikman has worked for Fox Sports for 15 years and has been the network’s lead NFL analyst since 2002. His reputation among staffers—especially those on his NFL production crew—is excellent. He is also known among sports media writers as being a particularly honest interview, and that was the case last week when Sports Illustrated contacted him about his network’s hiring of Skip Bayless. “To say I’m disappointed in the hiring of Skip Bayless would be an enormous understatement,” Aikman said. “Clearly, [Fox Sports president of national networks] Jamie Horowitz and I have a difference of opinion when it comes to building a successful organization. I believe success is achieved by acquiring and developing talented, respected and credible individuals, none of which applies to Skip Bayless." Aikman has specific reasons to be unhappy with the Bayless hire, which was made by Horowitz but ultimately approved by Fox Sports president Eric Shanks. 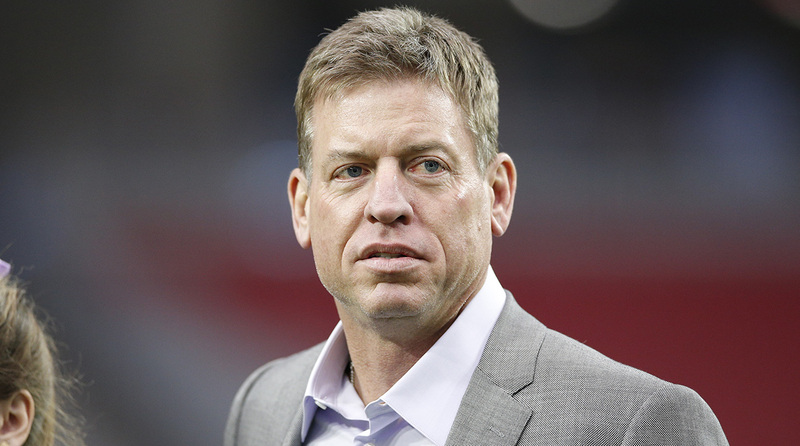 Fox Sports declined comment when contacted Monday about Aikman’s interview with SI. As a Fox Sports loyalist and the network’s longtime top NFL analyst—Aikman will call his fifth Super Bowl for Fox on Feb. 5, 2017, in Houston—you can understand why Aikman feels personally aggrieved by the Bayless hire. Aikman has a number of years left on his Fox Sports contract (and he opted to stay with Fox after Bayless was signed, which is a point Bayless loyalists would make) so it bears watching how Shanks (who is well liked by on-air talent) navigates any intersection between Aikman and Bayless, as well as those Fox Sports staffers (and Aikman has supporters all over the company) upset by what they see as a public slap in the face of one of Fox’s best talents. 1. ESPN spent a lot of marketing dollars pushing its opening college football weekend as the best in history, and Sunday night’s primetime game on ABC between unranked Texas and No. 10 Notre Dame proved to be most-viewed game of the lot. The game drew 10.899 million viewers, which ESPN research believes is the largest TV audience for an opening weekend college football game on record across all networks. (ESPN said its records date back to 1990 for ESPN and 1996 for ABC and 1996 with CBS.) Last year’s Labor Day game between Ohio State and Virginia Tech held the sport’s opening weekend best total live audience with 10,760,000 average viewers. ESPN said the Texas-Notre Dame game peaked at 13,522,000 average viewers between 11 p.m.–11:30 p.m. ET. 1b. Other ESPN/ABC overnight ratings included: USC-Alabama (4.9), LSU-Wisconsin (4.9), Oklahoma-Houston (4.0), and Clemson-Auburn (2.8). 2. Mike Tirico will be the future play-by-play voice for Sunday Night Football. His boss all but confirmed that last week in an interview with Sports Illustrated. “I certainly think he is in position to take Al’s [Michaels] role when Al decides to step away,” said NBC Sports chairman Mark Lazarus. “That I think is our collective expectation.” For more on my interview with Tirico, click here. 2a. One thing you have to give Horowitz and his team credit for is a savvy bit of trolling on ESPN. FS1 put up a billboard in Bristol, Connecticut (where ESPN is located), for Bayless’s new show, a stunt got major pickup including in the venerable Wall Street Journal. 2b. I think Joy Taylor, who will moderate Skip and Shannon Undisputed(which debuted Tuesday morning on FS1), has a lot of talent as a sports talker. Here’s hoping she has an extended career in the business. 3. Episode 74 of the Sports Illustrated Media podcast features the longtime professional wrestling journalist Dave Meltzer, the editor of the Wrestling Observer Newsletter and WrestlingObserver.com and a writer for MMAFighting.com. In this 75-minute episode,Meltzer discusses his journalistic approach to covering professional wrestling; how forthcoming wrestlers and WWE management are; how he approaches reporting on WWE vs. MMA; how important technical proficiency is versus mic skills; what he views ESPN’s foray into WWE content and why he’s not convinced they will cover the underbelly of the sport; how Brock Lesnar is treated in WWE as compared to everyone else, the rise of the Diva division; whether Hulk Hogan will return to the WWE; how he finds sources in pro wrestling, the future for Big Cass and Roman Reigns, his relationship with Vince McMahon and Dana White, his thoughts on the Raw/Smackdown split, and much more. 4. Sports Business Daily media writer John Ourand had some really interesting data about the cost of ads on NFL broadcasts. Ourand reported NBC is charging a record-high $700,000 per 30-second spot for Sunday Night Football and $560,000 per 30-second spot in Thursday Night football. Per Ourand, Fox is charging around $700,000 per 30-second spot for the 4:25 p.m. ET kickoff; CBS is charging around $650,000. Prices for the earlier afternoon kickoff range from $300,000 to $500,000 per 30-second spot. 5. The AT&T Audience Network—which is available on DirecTV and AT&T U-Verse—is in production for a documentary titled Religion of Sports, a six-part series which will examine the cultural and spiritual impact of sports around the world. Religion of Sports will premiere on Nov. 15 at 8 p.m. ET/PT on the Audience Network. Patriots quarterback Tom Brady and Fox Sports and ABC’s GMA staffer Michael Strahan are among the people behind the series.